Client's Bad Ideas: Obey or Say No? Have you heard things like this? When I first started working for other people – which was in fourth grade as a person who would type papers for older students because I had a computer and could type fast – I quickly heard the mantra we’ve all heard before. So it didn’t matter what a client’s idea was. I would work on it. But if you’ve ever been to a fancy resort on vacation, you’ve likely seen how far that’s gone wrong. People feel entitled and complain like you’ve never imagined – all believing that they’re always right. 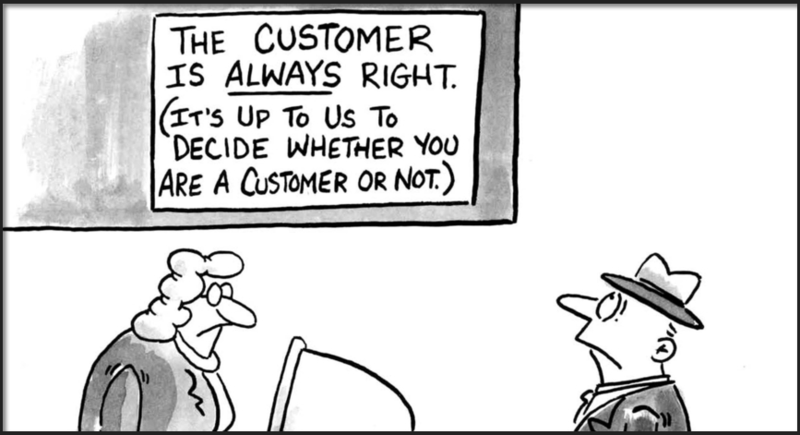 That customer, and most customers, aren’t always right. It’s their money. If you don’t do it, someone else will. The next version I heard of that same mantra was more nuanced. Sure, they were wrong, it admitted. But what mattered, what counted, was the fact that they had the money. You know, the golden rule. The one with the gold makes the rules. Only, if you’ve ever been to a fancy resort on vacation, you’ve likely seen how far that’s gone wrong. People feel entitled and complain like you’ve never imagined – all believing that they get to make all the rules. If we know they’re not always right, and we know that just because they have money doesn’t mean they can defy common sense or logic, what are we to do? This is where I find that it’s helpful to decide who you want to model your career after – the real estate agent or the tailor. Real estate agents can help you find the perfect house. They can leverage their knowledge of communities, pricing and more – all to help you find your dream home. They’re great servants. They’re there to help you. They only get paid when you get what you want. But at the heart of it, they get paid whether you have good taste or bad. Their commission isn’t dependent on you buying (or selling) a good home, a great home or a beautiful home. Like stock brokers, they get paid regardless of how well you do. Folks like that tell you that your job is to serve the customer and get yourself paid. So for them, they might say that when a customer shows up with a horrible idea/suggestion, your job is to execute on it, not to debate the idea on its merits. A tailor is also in the service industry. They’re there to help you. But at the heart of it, they get referrals and future work only if they make you look good. In short, they’re not like real estate agents or stock brokers. They have opinions. And those opinions count. They matter. Not just for you, but for their own well being. Because if you look stupid in a suit, nobody is going to ask you who your tailor is. Good friends, We’re tailors. Or should aim for it. If you’re a freelancer, you’ve likely felt this challenge of how to interact with clients when they have ridiculous ideas. But maybe you’ve not had a clear distinction between roles and why you might decide one way or another when hearing that crazy idea. Now you have a framework: you’re either a real estate agent or a tailor. The question is what will you choose? What will you invest in? How will you develop? When I hear it, I know I have to spend some time educating folks. I’m a tailor. I bring a strong opinion of what will look good. I am thinking not only about them, but their clients. And that is worth something. And what I know is that they’ll eventually figure it out. So I don’t mind telling them no when I hear crazy ideas. If they know they can trust me to call BS on their bad ideas, then they’ll also learn to trust me when I tell them they have a good idea. They may even pay me a premium to protect them from wasting their money. At least that’s what I remind myself of when I’m resting at a fancy resort on vacation.